Yesterday we arrived in Mallorca to spend a week with Michael’s brother’s family who is staying here in a Finca for several weeks this summer. We had booked a rental car in advance and were on our way within an hour from landing. By the way, if you think of going to Mallorca and renting a car keep a look out for offers that are full/full or empty/empty (this refers to the fuel in the car) as otherwise they make you buy the first load of fuel from the car rental and this is more expensive than buying it from a normal petrol station. 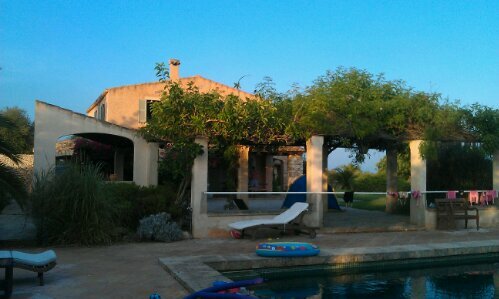 The Finca we are staying in is beautiful, has a pool and is near Santinyi, a beautiful town near but not at the coast in Mallorca’s south. It has lots of old sand stone houses and a lovely feeling to it as we saw when we checked it out yesterday evening. And it is full of Germans running places there but well that seems to be unavoidable here. So what did we do yesterday? As I confirmed with my guide book afterward we saw two highlights of the island which I can definitely both recommend: in the morning we went to a beach close to the finca. We drove into Mondrago National park and went to Cala S’Amarador. Because it is a national park, there are no hotels at this beach, just a small hut selling something to drink. As we were with the kids we arrived pretty early at around 9.30 a.m. and left at noon because then it is getting really hot and crowded. And what a super beautiful beach you reach after a little walk from the parking lot: a Mediterranean setting with sand stone and pines combined with a beach and very calm cristal clear turquoise water getting slowly deeper. This made it easy to spend ages in the water with the kids. If you are here for the beauty of this island and not for the party that Mallorca is famous for, this is definitely a must-see. 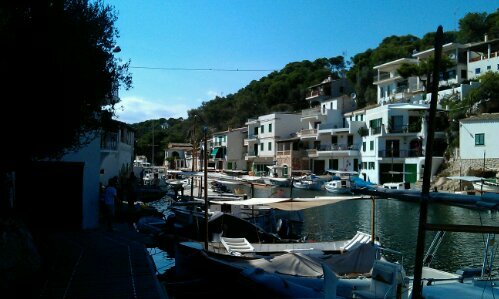 After a short stopover at the Finca where we had a quick lunch and all took a nap we made for the small port town of Cala Figuera which is also very close. It has a fjord like double bay which is a port and where fisher still land their ships and sell their catch. This was why we were there in the first place and the fish we had last evening was delicious. After the rest went already back home we took a walk around town which was a half hour tour. It was really nice but there isn’t much more than a nice setting for the port. So we left and stopped over in Santanyi on our way back. 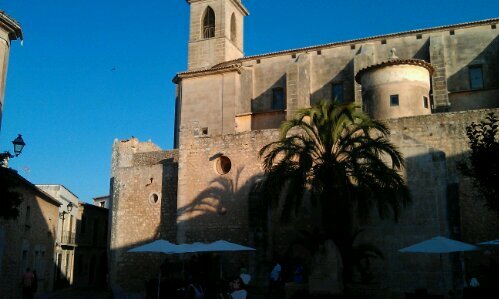 And today our destination was Palma. But more on that tomorrow. This entry was posted in Spain and tagged Beach, Mallorca, Summer by kathatravelling. Bookmark the permalink.